Just having finished The Bone Tree by Greg Iles, the sequel to Natchez Burning, I will be counting the days until the third volume of this series is published. Greg Iles’ novels were recommended to me by a friend who lived in Mississippi, and I was instantly captivated. They are an unvarnished look at the South as it was in the 50’s, and the stories of abuse and torture are chilling. These horrors are being discovered by a very appealing lawyer who lost his wife to cancer and is the father to a little girl. He found a new love in Natchez Burning, and she struggles to uncover truths long hidden, stimulated by her career as a journalist. Mr. Iles has the talent to make his characters real, and I was moved to tears in one portion of The Bone Tree. I am not giving a review of the book. My goal is to recommend it as a fantastic read and suggest that you check out Natchez Burning to understand the back story. I care about racism and violence, and abhor discrimination against anyone whom we deem “different.” I believe every being is a creation of God, and God is the only judge. The horrors depicted in these books jarred me to the depths of my soul. Remember the Sunday School song, “Red and Yellow, Black and White?” Could we practice that message in our daily lives and add anti-discrimination against our LGBT community? We have friends and loved ones who do not believe as we do in our spiritual lives – and we accept and love them. Why not accept and love everyone as our neighbor the way our Saviour taught? Once we reach that goal, how glorious the peace that will fill our being. Wednesday morning my eager eater Sam threw up his breakfast and, unlike the few times this had happened, he became very lethargic, refused to go outside, found his place on my bed and stayed there. This was so unlike him that I neglected the errands I had planned for the day. I downloaded the new Baldacci mystery and just stayed with Sam, reading and cuddling him all day. Around 6PM a friend came by with pizza, and I persuaded Sam to go to the kitchen. He showed no interest in food. I fed Sarah and Sam didn’t move, although I did get some water down him by putting ice in the bowl. I was very much afraid he would get dehydrated. As soon as the visitor left, Sam ran back to the bed and claimed my pillow. About 9PM I almost called my vet but decided to wait out the night. I was very much afraid for him. A couple of years ago Sam had to have emergency surgery, as he had a blockage caused by a t-shirt that he had swallowed. He had some of the same symptoms but not as severe. He is such a clown! Almost eight years old and still chews and misbehaves. Thank goodness he loves his crate because that’s where he is, partly for his own safety, when I am away from the house. A day and night such as this reminds me of how much he and Sarah comfort me and how important they are to me. I cannot imagine life without the loving eyes of a special fur baby. Sam is particularly adored. After John’s second Boykin Spaniel died, I called the breeder in South Carolina and flew there to get Sam and bring him home. He spent his first minutes in our house on John’s lap and was always by his side in bed or on his lap. Sam was so spoiled, we never heard John say “no” to him with anything but a loving voice. He had a terrible time adjusting after John’s death and mourned his loss for a very long time. At 4:30 AM he licked my face and wanted to go outside. By 7 he was ready for breakfast and has been fine ever since, his mischievous self. I am so thankful that both babies are here by my side and feeling great. Aren’t we who love dogs the fortunate ones? By the way, if you want a good read, try “The Memory Man” as it helped me through the day with Sam. I finished it before I went to sleep and enjoyed it very much. It is full of twists and turns and ultimately a move toward going on with life after unspeakable tragedy. Mother’s Day! We are inundated with messages about mothers, gifts for mothers, visits to mothers, accolades to mothers – I could go on and on. I have a friend who was not able to have children and now her own mother is gone. It’s a painful weekend for her and many others. There are those who have lost a child through an accident or illness. I cannot begin to understand their pain. To see all the happy postings must be very difficult. Some are at the bedside of a child who is very ill. Some are struggling as single moms to get through a workday and get a nutritious meal on the table. And there are those who were never close or cared for in a loving and protective way by their own mother. There are mothers who chose not to report abuse, both physical and emotional. These children and adults suffer and are among us each day. This Sunday perhaps a bright smile and a hug from you will make a mother whose children couldn’t be with her feel less alone. Reach out in kindness and never forget that we each have a story, and often it’s not a bright and cheerful one. I know how fortunate I am that my two plan to be with me and celebrate with me. My husband always made Mother’s Day special, and our kids learned by observing. I am one of the lucky ones, and I don’t forget how blessed I am for one minute. In January of 2014, Mary Kathryn and I shared a two bedroom apartment in Little Rock as she recovered from surgery. That is when I became aware of the need within myself to be free of all the “trappings” and to downsize to a home that was right for me as an elderly widow. I decided to have a sale, and the person who handled this was Roy Dudley, located in Little Rock. It was a challenging decision to open my home to the public, but I became excited during the process of living unencumbered by “things” and ignored the feelings of intrusion. Roy took the items that did not sell to Little Rock and sold most from his warehouse there. Making a decision to sell a particular watercolor painting that I loved was difficult, though I had no place to hang it. When I was told it did not sell, I was relieved and excited. It is now hanging in Mary Kathryn’s guest bedroom, and I enjoy its beauty when I visit. Mary Kathryn and Johnny both had the opportunity to choose anything they wanted to use to furnish their homes, and they helped me eliminate the clutter that they would never use. Mary Kathryn was busy getting settled in her apartment in Little Rock during my move. Johnny spent a week in Jonesboro helping me, and I will always be grateful for his insight and hard work. My closet has just the clothing that I wear. I keep a large shopping bag on the floor of the closet to toss the articles that I don’t need or wear, and they are ready to take to a charitable organization. Material objects are just that. I no longer wanted to be controlled in that way. The irony of all this is that the piece of furniture I most wanted to sell graces my living room today. It is a huge antique breakfront purchased by my grandparents in the 1950’s. It has been moved many times and finally found its home at First Bank. When the bank became Simmons First, it was moved to our home on Harrisburg Rd., then to another home, then still another! The first thing anyone said when they walked into my new place was that the long wall in the living room was perfect for the breakfront. And it is. I am happy with it for the first time, as it embraces pieces that I cherish. I kept and display special pieces, gifts from friends or handed down by family. One of my favorite memories is that, before we were married, John and I visited my great aunt in Jackson, Tenn. She was very ill and told us she wanted us to select a piece of her cut glass as our wedding gift. I asked John to make the choice as he loved cut glass, and I knew next to nothing about it. He brought a lovely deeply cut bowl to her bedside. She responded, “any but that piece, it was my husband’s wedding gift to me.” In later years, her son died and his belongings were left to my mother. This beautiful piece is now displayed in my home, and I remember and relive that special day in my relative’s bedroom as if it were yesterday. Since my place is uncluttered, I appreciate the items that we chose to keep. I enjoy each piece more than ever because there aren’t “ten things on a table.” It’s pleasant a year after downsizing to still have some bare shelves. I can’t quite call myself a minimalist, although I am moving in that direction. As I read a lot, several have asked that I write about books that have impressed me. I have only given one or two book reviews in my life, so in no way am I an authority on what people want to know before choosing a book. I’ll just tell about why the book appealed to me – or did not! I read Still Alice by Lisa Genova when it was newly published, and was intrigued by the way she portrayed emotion and – though I haven’t seen the movie – I remember her book as if I read it yesterday. When I saw that she has a new book on the New York Times Best Seller List, I quickly downloaded it and finished it last night. The subject is one that is difficult to depict because it is about a family devastated by Huntington’s Disease. After Joe’s diagnosis of Huntington’s was confirmed, he knew the gene had been passed to him from his mother. He realized that she was not an alcoholic, as she was branded, but a victim of a dreaded disease. Each of his children reacted in different ways to being tested. 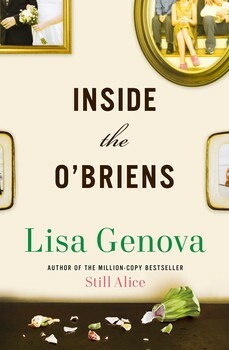 It is a tough book to read, but if you are interested in good writing and watching a family as they work through a crushing diagnosis – and are not afraid to shed a few tears – I recommend this as a visualization of how the O’Briens learn to embrace each new day with love. Let it be an inspiration, and it will be worth your time.